The June 2012 issue of the International Journal of Sports Physical Therapy contains a study showing that low handicap golfers have 50% more hip strength than high handicap golfers. This is the second study in the past seven years to find a positive link between strong hips and a low handicap. No such link has ever been found between arm, leg or trunk strength and handicap. Since hip strength is so important to performance, you will want to check your own hip strength, as well as that of your students. You may find a hidden problem that is preventing some of them from lowering their scores. Lying on your stomach, bend both knees 90º and, keeping your knees together, move your feet apart. Now have someone hold your feet apart as you in the illustration. Try bringing your feet together. If your hips are strong enough for golf, you will be able to snap them together will no problem. After all, your hip muscles are much bigger than their shoulder muscles. But most golfers will find they have to struggle to bring their feet together. It tells you that even though your hip muscles are a good size, your brain is not ‘recruiting’ enough of the tens of thousands of individual muscle fibers that make up each muscle. Each muscle has hundreds of nerve fibers going to it. Your brain fires just enough fibers to ‘get the job done’. For the hip rotation muscles, this means a tiny fraction of the fibers in each muscle, because hip rotation is the only movement in life and the golf swing for which there is no natural resistance. Your arms, legs and trunk get a good workout every time you hit a ball, but the hips do not. Fitness trainers have long recognized that hip muscles can be weak in golfers. The conventional remedy is the belt and bungee cord to provide resistance. But this is awkward to use. 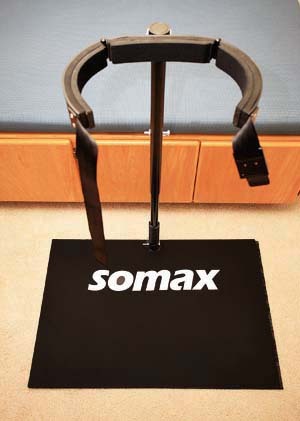 A new alternative is the Somax Power Hip Trainer, a new exercise machine designed expressly to provide the resistance you need to increase the strength of your hips for golf. Consisting of a rugged, non-slip steel base to the back of which is attached a high tensile strength steel spring and a steel connecting tube that adjusts to hip height on top of which is a padded steel hip cinch, the Power Hip Trainer comes with a DVD containing 26 drills for right and left-handed golfers. The heavy steel spring bends easily to adjust to your personal golf posture, but provides the resistance you need to build up hip strength and speed. The hip cinch can be adjusted to a closed position to develop strength, and an open position to turn your hips faster than you can turn them yourself. The Power Hip Trainer has proved very popular with teachers. One PGA pro increased his swing speed 26 mph after just his first 15-minute session on his hip trainer. A student of ours increased his average drive from 290 to 350 after training on his hip trainer for 9 months. The reason hip strength and speed is so important to performance is the hidden speed multiplier built into every golfer. 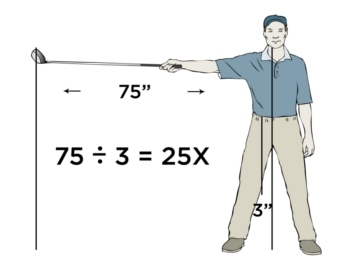 It is the 25X ratio of the 3” distance of the hip joints to the center of the body and the 75” distance of the club head to the center of the body. 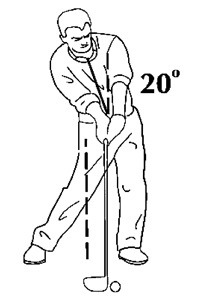 This means that any increase in hip speed will be multiplied 25X at the club head. By increasing the strength and speed of your hips you gain more effortless power, instead of ‘powerless effort’ that comes from relying on the arms to power your downswing. As everyone knows, you play better golf when you reduce needless effort in your swing. But there is another reason to increase your hip strength. You reduce the need to over-contract your obliques on your downswing. Most golfers are stronger in their paper-thin obliques than their massive hip muscles. Are you? Sit on a chair or stool. Cross your arms across your chest and turn your shoulders to the right. Now have someone hold your shoulders by putting their left palm against the back of your left shoulder and grabbing the front of your right shoulder with their right hand. Now turn your shoulders back to center. If you are like most golfers, you will find this easy to do. This is because your trunk muscles, or obliques, get a good workout with every swing your take. Plus many golfers do sit-ups, crunches and ‘core’ work to further strengthen these muscles. But this can be a mistake, because it leads to spraying balls off the tee. At address, most golfers have a slight tilt to the right. But at impact, this front spine angle can be 300% greater, as you can see here. This massive increase in front spine angle is caused by over-contracting the oblique (stomach) muscles on the right side of the trunk—usually to make up for weak hips. The problem is that this increase in front spine angle opens the clubface at impact, pushing the ball to the right. You can verify this for yourself by standing at address with your driver, and then just bending your trunk to your right. 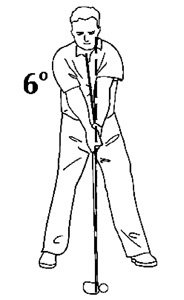 You will see your clubface opens as you see here. Once this happens, you then have to correct your clubface with your hands in the last 1/100th of a second before impact—a tricky proposition for even the most talented golfers. If you are late, the ball goes right. If you overdo it, the ball goes left. If you are lucky, the ball goes straight. This is another reason strong hip-strength golfers shoot lower scores. They don't increase their front spine angle as much as weak hip-strength golfers, thus making it easier to keep their drives in the fairway and increase their control over their irons. Longer, more accurate drives and fairway shots—two good reasons why you want to make sure that your hip muscles are stronger than your trunk muscles. To view several videos on the Power Hip Trainer and place your order, please go here.